« If Chile’s “Neoliberal” Experiment Is a Failure, Why Is the Nation More Prosperous than the Rest of Latin America? Experts in the field of political marketing periodically tell me that you need to have sympathetic victims when trying to change policy. When pushing for Obamacare repeal, highlight a family who lost its health plan and now has to pay twice as much for insurance. When advocating for repeal of the death tax, publicize a small business that would be wiped out by that pernicious form of double taxation. When building support for tax relief, find an entrepreneur who is being driven into the ground by capricious and excessive demands. That’s probably good advice. When people have real-world examples – especially ones they can relate to – that presumably helps them understand the need for a reform. I have to admit, however, that my approach is generally more wonky. Whether I’m meeting with a policymaker, giving a speech, or writing a column, I view my role as trying to help people understand one or more basic economic concepts (the importance of lower marginal tax rates, for example). I think there’s value in my approach (if people grasp an underlying principle, that can impact their understanding of both current and future policy fights). But there’s no reason why I shouldn’t do both. So I’m going to begin today’s column about occupational licensing (when state governments impose restrictions and regulations that limit who can work in a particular field) with a sympathy-eliciting example that hopefully will resonate with readers. Consider what happened in New York City recently now that bureaucrats have decided that people couldn’t be dog sitters without going through all the red tape to become a licensed kennel. Pet lovers are barking mad over a little-known city rule that makes dog-sitting illegal in New York. Health Department rules ban anyone from taking money to care for an animal outside a licensed kennel — and the department has warned a popular pet-sitting app that its users are breaking the law. “The laws are antiquated,” said Chad Bacon, 29, a dog sitter in Greenpoint, Brooklyn, with the app Rover. “If you’re qualified and able to provide a service, I don’t think you should be penalized.” Bacon, a former zookeeper and wildlife researcher, signed up for the app to help make ends meet while he was between jobs, but did enough business that he now makes his living from it full-time. Now that we’ve identified Mr. Bacon as our sympathetic example, let’s look at the broader issue of the government creating barriers to employment and entrepreneurship. By the way, that’s not an argument for regulating babysitting (the kind of nonsense you might find in California). Instead, it’s a reason why state governments shouldn’t be going overboard with licensing rules. The Institute for Justice just released a study on licensing rules for jobs that generally employ lower-skilled individuals. Occupational licensing is, put simply, government permission to work in a particular field. In the 1950s, about one in 20 American workers needed an occupational license before they could work in the occupation of their choice. Today, that figure stands at about one in four. Securing an occupational license may require education or experience, exams, fees, and more, and working without one can mean fines or even jail time. …Policymakers, scholars and opinion leaders left, right and center are increasingly recognizing that licensing comes with high costs—fewer job opportunities and steeper prices—and does little to improve quality or protect consumers. …Most of the 102 occupations are practiced in at least one state without state licensing and apparently without widespread harm. Only 23 of these occupations are licensed by 40 states or more. The last section of that excerpt is critically important. Special interests argue that occupational licensing somehow protects people, yet we have real-world examples for all 102 professions of states that have zero licensing restrictions and we don’t have examples of people dying or being harmed because of unregulated florists or rogue cosmetologists. And shouldn’t there be some evidence of societal benefit before government restricts economic freedom (the same argument I’ve used when analyzing OSHA)? As you might imagine, some states are worse than others. Here’s a map showing the degree to which state politicians conspire with special interests to create cartels in various fields. 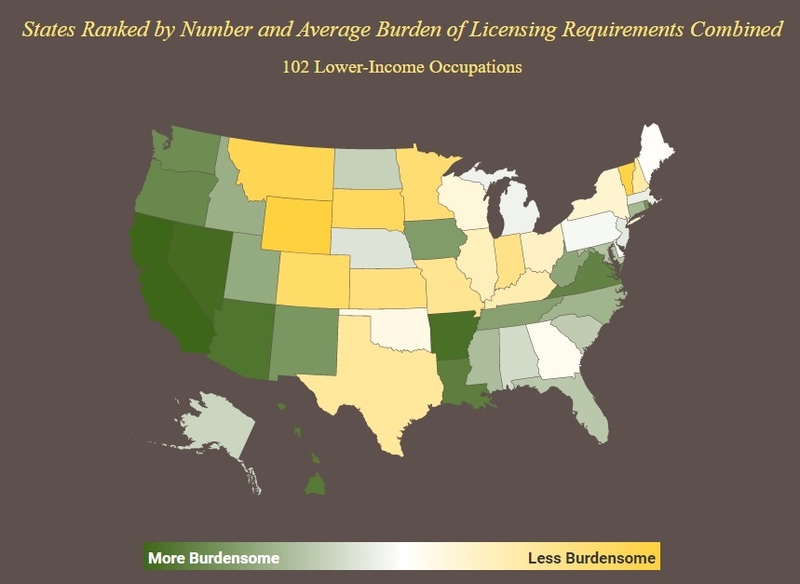 Louisiana and Washington are the worst (based on number of licensed professions) and Wyoming and Vermont (yes, that Vermont) are the least onerous. 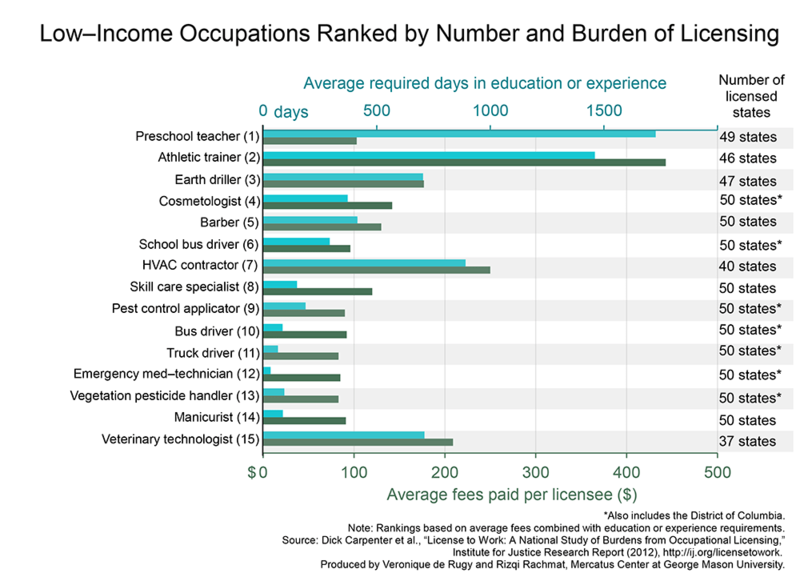 Having written about a horrible example of occupational licensing in DC, I’m surprised that the District of Columbia isn’t at the bottom of the rankings. Or Alabama. Though I’m not surprised to see that Oregon is green. Here’s the report’s accompany video. If you liked that video, you can click here for another video on occupational licensing. A column by Conor Friedersdorf in the Atlantic highlights some of the findings in the IJ study. And he points out that consumers and workers (those outside the cartel) are the victims. These requirements…are at their most pernicious when they are both needless and most burdensome to the middle class, the working class, and recent immigrants to a society. The IJ report focuses its attention on these cases, surveying 102 lower-income occupations across all 50 states and the District of Columbia. It concludes that “most of the 102 occupations are practiced in at least one state without state licensing and apparently without widespread harm.” In other words, dropping many of those requirements likely wouldn’t do any harm. …Too often, occupational-licensing laws are less about protecting workers or consumers as a class than they are about protecting the interests of incumbents. Want to compete with me? Good luck, now that I’ve lobbied for a law that requires you to shell out cash and work toward a certificate before you can begin. The Wall Street Journal also opined about IJ’s new report. More than ever, the government requires Americans to get permission to earn a living. In the 1950s one in 20 workers needed a license to work; now about one in four do. The rules hurt the working poor in particular, but everyone suffers in states with the most licensing requirements… Hawaii’s prerequisites are the most grueling while Louisiana and Washington regulate the most professions, with both states requiring a license for 77 lower-income fields. …California has the most dysfunctional regime. Across professions, it has established “a nearly impenetrable thicket of bureaucracy” where “no one could” provide a “list of all the licensed occupations,” as one state oversight agency admitted last year. …The cost and time to obtain a license is no accident, as professional guild members sit on state licensing boards and reinforce the racket. They want to limit competition to keep prices high. …Stiff licensing requirements are often prohibitive for America’s working poor, keeping them trapped in low-wage, low-skill jobs. …Nationwide, licensing drives up prices by as much as $203 billion annually. The requirements also hurt consumers by restricting access to goods and services. The WSJ editorial points out that both political parties are guilty of supporting these insidious cartels. Here’s an example, from Reason, of Democrats behaving badly. California Democrats prattle endlessly about helping the working poor, but their latest vote against a bill that would tangibly help financially struggling people shows that Democratic leaders are more interested in serving their real constituencies: state bureaucracies, unions and other interest groups that want to keep out the competition. …California has the nation’s highest poverty rates, according to a new U.S. Census Bureau standard that includes cost-of-living factors. A good starting place to address that problem is to chip away at unnecessary barriers to work. Trade groups, however, recognize that the best way to inflate their members’ pay is to raise the cost of entry for others—and the more fields regulated this way, the more it keeps poor people in the welfare lines. …Such concerns prompted even the Democratic Obama administration to call for far-reaching licensing reforms, yet California’s Democrats don’t even seem to understand the point of such efforts. Or maybe they just won’t let themselves understand the argument, given their political alliances. And Reason also identifies a Republican behaving badly. Let’s close with an image that is both amusing and sad. Amusing because it mocks government and sad because it’s true. It’s basically the cartoon version of something I shared last year. P.S. Returning to the issue of political marketing, I actually do use real-world examples for some purposes. My Bureaucrat Hall of Fame is nothing but horror stories about specific government employees pillaging taxpayers. and my collection of honest leftists also is based on specific stories of statists inadvertently revealing something important. P.P.S. Business permits at the local level also are akin to occupational licenses. Governments are making people pay to become entrepreneurs. Which oftentimes translates into painful lessons for young people about government greed.